From the kitchen of One Perfect Bite...We call her "The Girl with Red Ribbons" and thought she was a fit subject for the Work of the Poet: Ruby Tuesday meme. She was a lovely child. The photograph was taken in an outdoor cafe in the Muslim quarter of Xi'an China. The call to prayer had interrupted her meal and she was fascinated by the stream of believers pouring into the mosque compound. Though the area was a Muslim enclave, the restaurants outside the mosque served an incredible array of food, including pork. Obviously, not all the merchants and visitors were Muslim, so it was only mildly surprising that red cooked pork was a popular item in the cafes. Today's recipe is for an incredibly good version of red cooked pork. When this is made with pork belly or not-to-lean pork ribs you have the makings of an unbelievably easy feast. My friends and teachers, Lily, at Lily's Wai Sek Hong, and Ning, at Heart and Hearth have wonderfully authentic recipes for this great entree. Here's my westernized version of the classic. 1) Melt sugar in vegetable in a medium pot over medium high heat. Cook, stirring, until sugar is slightly brown, about 3 minutes. Add pork cubes to pan and cook in caramelized sugar until brown on all sides, about 8 minutes. 2) Place garlic, star anise, dark soy sauce, rice wine and broth in pot. Simmer, covered, over low heat for about 40 minutes, stirring occasionally. Transfer meat to a bowl and tent with foil. Boil sauce to reduce by half. Dissolve cornstarch in water and add to pan. Stir until sauce comes to a boil and begins to thicken. Return meat to pan. Toss in sauce until all surfaces are coated. Transfer to a platter, garnish with scallions and serve hot. Yield: 4 servings. All the ingredients sound delicious and the photo has my mouth watering. What a lovely dish. It's a delicious seasoning you putting in there! What a beautiful little girl! And I love the red ribbons in her hair. Red Cooked Pork very good indeed! I like the addition of the star anise; it has really piqued my interest. Those seasonings sound fantastic on that pork. I love the name. Your photos are enthralling. Oh wow...this looks out of this world! 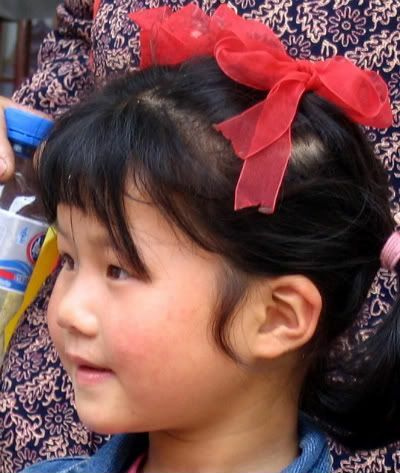 What a sweet little girl w/a red ribbon in her hair :) Enjoy your day, Mary! Your dish looks so rich and delicious! Beautiful photography! These ingredients look so delicious ! The little girls with red ribbon she is so cute! Sweet face. Your pork sounds good. Just lovely. Can you save me some? wow everything sounds delicious... I love pork and I think its unappreciated by so many so I am so happy to see such a fabulous recipe! Lovely curry recipe! Surprising, indeed, to find this in restarants surrounding mosques, but it makes sense, gotta cater to everyone! Mary, your Red Cooked Pork looks like it would melt in your mouth, but then, everything you share with us looks scrumptious. I always enjoy your photos ... the little girl is so precious with her pretty red bows, and I love your photo of the blue corn in yesterday's post. Wow, Mary, even though I don't usually fare well with cooking meat, this one looks too good to pass up! This sounds delicious and will satisfy a craving we've been having for something different. Thanks so much Mary for your comments at GrannyMountain today. I wanted to share the saving aspects of living green. Everyone dreads the summer bills and they don't have to. I am so happy to meet you. Thank you most sincerely for stopping by my blog recently. I will have to come back to see more of your blog. The little girl with red ribbons is just precious! I love anything doing with the Orient...food? Yummy. Decor...pretty and delicate. People? Beautiful!!! This is a perfect post from you my dear....at Perfect Bite!! Happy day to you Mary. This sounds like a delish pork recipe. Will try it soon. Laura, I've kept a portion on the back burner to warm. Stop by again and it's yours. Awww! I love the title. The pictures are making my stomach growl this looks great. What a wonderful story you shared today. I cam by to let you know I made the Tuscan Pork and Raspberry Ripple for guests this weekend and, of course, they were a huge hit. Thank you so much for your wonderful recipes. Now excuse me while I go get that recipe for blue corn muffins! Happy RT, Mary! This indeed is a pretty girl with the red ribbon. I have been to Xi'an and saw your Terra Cotta Warriors and Horses. It was magnificant! Isn't it something that it was found! A part of those warriors and the horses are on exhibition here in Houston, Texas, this summer. Since we saw even more of them in China we won't be going down into Houston this time. Red cooked prok. Wow Mary, always something amazing at your place. Yum! I would love to try Star Anise sometime! 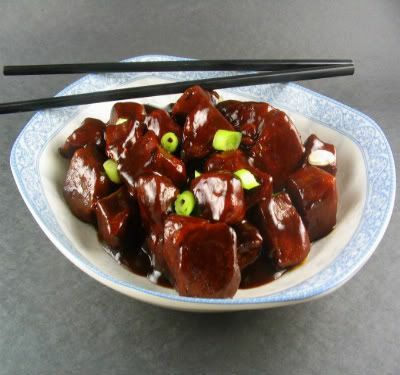 Red pork! I have yet to see one. :) Thanks for sharing this interesting trivia, too. Now I want Red Cooked Pork. I am searching for star anise - and I know I need to go to a specialty store. This recipe is incredible! Just mouth-watering. ANd the photo - what a little beauty. Oh she is a cutie with a very sweet smile! Claudia, you can get star anise through Penzey's catalogue. Looks so amazing and authentic! How did you get that great colour? The picture of the girl is so sweet and striking. Natashya, That is the color I get when I cook in soy sauce. I didn't do anything special to get the color. Your red cooked pork looks amazing and I love the picture of the little girl with the red ribbon too. As soon as I read the title, I thought, "oh I hope this is a recipe!" Thank you! The photos are lovely and the recipe mouth-watering. Maybe tomorrow evening...and if people ask, star anise is available at any Asian grocery store. I love the little girl! I love photographing children but I'm always concerned about posting photos of children i don't know. Great photos! The recipe sounds really yummy! Thanks for sharing the recipe! Have a great day!! Loved the photo of the girl, she is so beautiful! Oh, now I'm hungry! Great pics for Ruby Tusday! Love that little girl! What a precious little girl with red ribbon!! wonderful shot and delicious recipe, thank you!! What a sweet little girl..love the red ribbon. Lovely photo of a lovely little girl. Thanks for visiting my Ruby Tuesday post. I'll try to come back and check out the rest of your blog! I love the red ribbons in that little girl's hair. So sweet. Your beautiful blog is making me hungry.. This looks good enough to run out and eat right now... if only I had some. Great post and I will give your site to my mom... she cooks more than I do and she loves to read cookbooks... like novels! Thanks for stopping by.